I met Matt and Kat in Ninh Binh in northern Vietnam. They were a British couple cycling across Southeast Asia for six months. Being the only people in our guesthouse, we spent a couple evenings eating, drinking beer, and talking. We became friends out of necessity, less for them because they had each other and more for me, who was a bit bored from being alone. And then, like so many travel relationships, it was time to say good-bye. In the blink of an eye, it was time for all of us to move on. But, during our time together, we had actually grown to enjoy each other’s company and made vague plans to meet up again in Ho Chi Minh City. And, over drinks, what started off as an off hand comment became solid plans to join their bike trip for a few days. 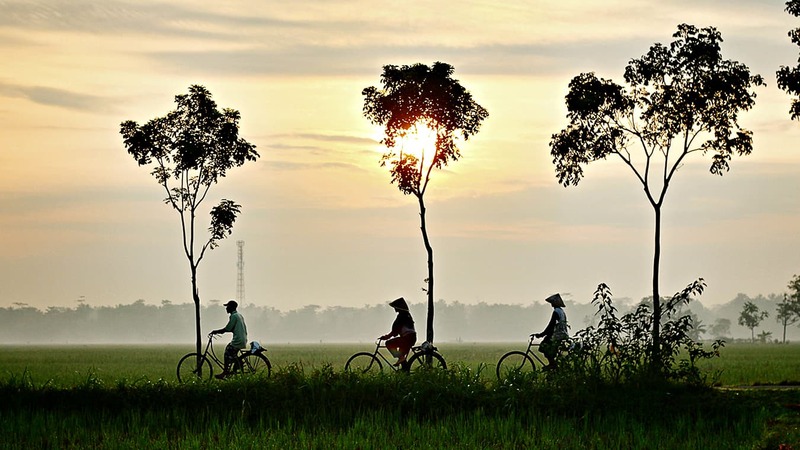 Our plan was simple: I’d bike with them across the Mekong Delta then take the bus back to Ho Chi Minh City, while they continued on to Cambodia. I didn’t want to buy a bike and wasn’t outfitted for a multi-week excursion, but a couple of days over flat land seemed totally doable. Our first day’s plan would take us to My Tho about 80km away. Though I was no expert in kilometers, it still seemed like a long distance to me. After spending a day searching for a bike in Ho Chi Minh City, I stored my stuff at my guesthouse and we left early the next morning. The chaotic streets of Ho Chi Minh City are a no-rules zone. Pedestrians walk without looking, motorcycle drivers ride on sidewalks as they chat on their phone, and cars and trucks merge with utter disregard for others. It seemed the only rule was to drive aggressively and let everyone else adjust. Matt and Kat led the way and I followed as we merged into multilane highways with no shoulders, careful not to get hit as giant trucks raced past us. Soon, rice terraces, dusty roads, and houses in the distance replaced the chaos of the city. We stopped for photos and kids would come racing up to us to practice their English, look at our bikes, take pictures, and laugh at our sweaty appearance. As the day dragged on and the sun got high in the sky, I began to run out of steam. I was not in as good shape as I thought. Though I was a healthy eater and regular at my gym back home, being on the road for over six months had taken its toll on my body. My legs were sore, my pace slowed, sweat-stained the back of my shirt. My friends looked at me with pity. “Maybe we should rest,” Matt said empathetically. “Yeah, let’s stop for lunch,” Kat said. We pulled into a restaurant by the side of the road. The proprietors gave us strange looks. It’s probably not often that three sunburned foreigners pull in on bikes. We sat down, rested, cooled off, and gorged ourselves on pho. We kicked back multiple cans of coke – trying to replace the sugar we lost on the bike ride. I drank slowly, hoping to extend our rest stop as long as possible. Matt found a route off the highway through the countryside. “It’ll be more scenic and relaxing than this main road,” he said, still worried I wasn’t enjoying myself. We got off the main road and headed through a few little towns when we realized we were really lost. Way off the highway, we were now in deep trouble. No one spoke English. We made some gestures at the first group of locals we saw, with no luck. Group two provided just as unhelpful. We tried to figure out a route but ended up back where we started. Finally, we came across a guy who spoke a little English. He pointed us in a direction we could only hope was right. So we biked. And biked some more. There was still no sign of the highway. Just empty roads and the occasional house. Eventually, we found a convenience store, and after some clever sign language on Kat’s part, learned how to get back to the main road. With 25km to go, I was dragging behind again. Our brisk early-morning pace had come to a crawl as I pedaled with lead in my legs. While Matt and Kat were reassuring, their faces revealed a hidden frustration at the time it was taking to cover the distance. What did we get ourselves into they must have thought. Around 6 pm, we finally pulled into My Tho. I was barely biking at this point, moving only by inertia. I decided that after we had checked in and, drank a very cold beer, I was off to bed. “Passports, please,” the clerk of the hotel said. We all got them out. “What’s this?” she asked looking at my photocopied paper. Before we had left Ho Chi Minh City, I had dropped off my passport at the Thai embassy so that I could get a two-month visa: one month for learning Thai and the other for traveling around Isaan. Being the smart traveler I was, I kept a copy of my passport and my visa for hotel check-ins. “It’s my photocopy,” I said, explaining the situation. “But it’s me. Look, I even have backup,” I said, pulling out all the papers that proved I was me, hoping to be granted a reprieve. “Sorry, the police are very tough here. No passport, no stay,” she said. After trying and failing at five other places, it didn’t look like I would find a place to stay. If we had gotten in earlier, we could have searched longer or come up with a solution. But the sun was setting — and with it the last bus was going back to Ho Chi Minh City. I had to decide quickly what to do. “There is a bus to Ho Chi Minh City at 7pm. You can take that back,” said the owner of the first guesthouse. As my guesthouse owners back in Ho Chi Minh City already knew me and wouldn’t ask for a passport, heading back to the city was the only safe bet. We got on our bikes and raced to the bus station. If I missed this bus, I might be sleeping on the street. Luckily, buses here didn’t really follow a set schedule, and they waited until the last minute for late passengers (if the bus were full, it would have left already). This might give us extra hope. Despite our fatigue, we kept pedaling, trying to get to the bus stop in time. We went down the wrong street and had to double back. I was sure that I had missed the bus, but, pulling into the parking lot, we saw it that it was still there. I said good-bye to Matt and Kat, apologizing profusely for all the trouble, thanking them for the experience, and promising them drinks when we met up again in Cambodia. I plopped into the bus seat among locals gawking at my disheveled and dirty clothes and fell asleep until Ho Chi Minh City. It was 10pm when I finally got back to my guesthouse. I walked to the bar next store and saw some other friends. They looked at me as I sat down. They saw the tiredness. The defeat. The sweat. The dirt. “We might need some more beer for this story,” I said as I began my tale. Find a cheap flight to Vietnam by using Skyscanner or Momondo. They are my two favorite search engines. Start with Momondo. Travel insurance will protect you against illness, injury, theft, and cancellations. I never ever go on a trip without it. I’ve been using World Nomads for ten years. You should too. Check out our resource page for the best companies to use! Want More Information on Vietnam? 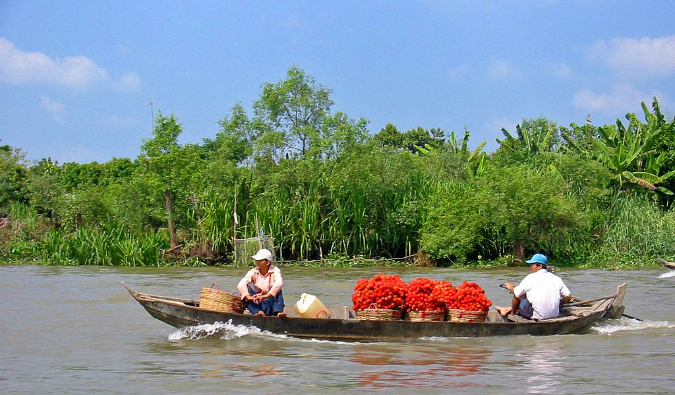 Be sure to visit our robust destination guide on Vietnam for even more planning tips! 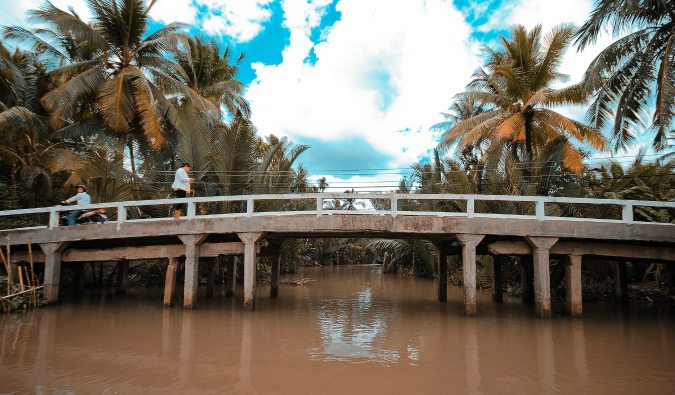 The post Biking the Mekong Delta in Vietnam appeared first on Nomadic Matt's Travel Site.